"I can see you now!!!" Brad exclaimed when he finally saw his dear wife, Jackie, for the very first time, after four years of marriage! "Yeah, that is me!" Brad smiled from ear to ear as he looked at himself in a mirror. The last time he saw himself was 13 years ago, before he suffered a 1500°C molten aluminum burn. 13 years ago, at age 31, Brad suffered from a 1500°C molten aluminum accident and completely lost sight in both of his eyes. After 15 extensive eye surgeries at several major medical centers, Brad was told that he would never be able to see again. During the past 13 years, Brad lived in nearly total darkness (barely light perception vision). He married Jackie Barnes four years ago, but until now, he had never seen her. Brad's journey to sight began again in the fall of 2004, when he was referred by doctors at Washington University, St Louis, MO to Nashville, Tennessee's Wang Vision Institute, to see Dr. Ming Wang, an international expert in the research and development of new sight restoration surgeries. Dr. Wang examined Brad and concluded that Brad's injury was so severe that all of his tear glands were in fact completely destroyed. The only way that Brad could be helped is through an innovative eye surgery, laser-assisted artificial cornea implantation, combined with saliva gland transposition. 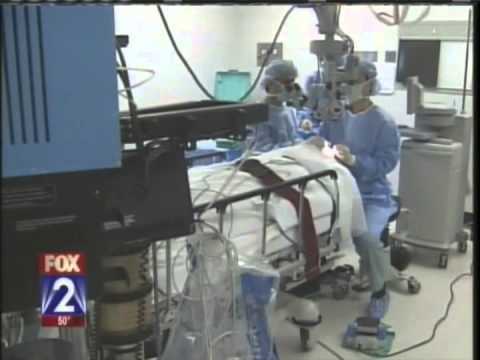 Brad thus became the world's first patient to have received the combined saliva gland transposition and laser-assisted artificial cornea implantation. When the eye patch was removed, after two and half-year surgeries with Dr. Wang, Brad Barnes finally was able to see, for the first time in 13 years, and see his dear wife Jackie's face for the very first time.